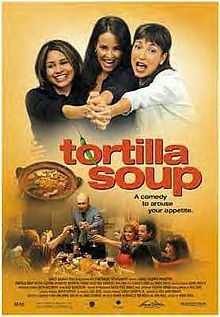 Tortilla Soup is an American comedy-drama, directed by Maria Ripoll. It’s actually based off “Eat Drink Man Woman“- the Taiwanese original. Both definitely have their own merits. The story revolves around the Naranjo family. Martin is the dad and the strong head of his three girls. His daughters- though adults, still live at home and the movie centers around the family dinner. Why the family dinner? Because food plays a huge role in this movie. Martin is a semi-retired chef, but since losing his wife, he has also lost his senses of taste and smell. Despite that, he still cooks ridiculous, multi- course meals for his family and friends and is known for his cooking skills. It’s his way of loving. 1-Leticia, The oldest and the most conservative of the three. Religion plays a big roll in her life, and she’s a teacher at a local high school. 2- Carmen- The middle gal, and career woman and surprisingly, has a knack for cooking just like her papa. 3-Maribel- The baby. She’s young, trendy and I think it would be fitting to put her into the rebel category. Of course, you get the vibe already that this isn’t the the set up to any special story. I mean, they set it up like any other goodhearted story, where you have four lost characters and hopefully, in the end- they find whatever they need. Whether it be relationship or a experience they were lacking. And of course they do. This is a goodhearted film. You come away from it feeling good. Satisfied even, because you knew how the story would end from the moment you started watching it. What I think really makes the film, is the pick of actors/actresses. Personally, I love both Hector Elizondo and Tamara Mello (Father and Youngest Daughter). I don’t think I realized it until this film. I’ve seen them in other works …. (Princess Diaaaaaaaaries, anyone?) They pulled it together, and added the warmth this movie needed. If you’re looking for a lazing-on-the-couch-on-a-tuesday-night movie, this is it.